Sea lice on a juvenile salmon. 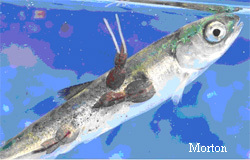 The sea louse on the back of the salmon is a fully mature, motile, adult female, and thus the most lethal. Photo courtesy of Alexandra Morton. Have you ever noticed those tiny little oval things stuck to the salmon you just caught? Most likely they are sea lice, tiny crustaceans that have been around as long as salmon have been swimming. These small copepods are incredibly abundant – they constitute the largest source of protein in the world’s oceans in their early larval stages. Copepods have colonized almost every aquatic habitat on earth, and collectively comprise the largest animal biomass on earth. The life cycle of the sea louse, like all crustaceans, is a series of molts. At the napulii stage the sea louse is free swimming and does not feed, instead gaining nutrients from internal yolk reserves. In the intermediate copepod stage the lice use their hooked antennas and frontal filaments to attach themselves to fish; they are still too small to cause any real damage as they feed on the juvenile salmon. As the lice move through the more mobile pre-adult and adult stages they attach to the fish by suction and can become lethal. The lice are able move, or “graze” on the host fish’s body, preferring the head, back and perianal areas. Their preferred diet is mucus, blood, and skin. There are two species of sea lice found on salmon, Caligus elongates and Lepeophtheirus salmonis. C. elongates effects many species of marine fish, while L. salmonis is found only on salmon and related species. Sea lice are common on adult salmon, and fall off as the salmon return to freshwater streams to spawn. This insures there are no surviving sea lice where the juvenile salmon outmigrate in the spring. Sea lice have been around as long as salmon but have only recently become an issue. How did this tiny copepod rise out of the mucus and into the international spotlight? A change in the ecosystems of some of the sea lice L. salmonis has pit industry against science in Norway, Scotland, Ireland, and British Columbia. When commercial fish farming in net pens began in British Columbia, Alaska fishery scientists initially feared farmed Atlantic salmon would escape from their pens and compete for food with native Alaska populations of wild salmon. Salmon farming is illegal in the Exclusive Economic Zone in Alaska, but is legal in neighboring British Columbia. However, what has emerged as a larger issue in this commingling of species is the increase in sea lice L. salmonis found on juvenile wild salmon migrating through areas near salmon farms, whose crowded conditions provide an ideal breeding ground for sea lice. The life stages of Lepeophtheirus salmonis, the sea louse most commonly found on salmon. Their life cycle is 7-8 weeks. Image from University of Prince Edward Island. In the wild, juvenile salmon and adult salmon rarely mix. Fish farming as it is currently practiced allows adult salmon to be reared in static mesh pens near juvenile wild salmon’s migratory route. Wild salmon close to fish farms are 73 times more likely to suffer lethal sea lice than juveniles not adjacent to fish farms. A fish farm can also elevate the rate of sea lice infestation in salmon up to 40 miles from their pens. Sea lice can survive for about 3 weeks off their host -- making transfer from farmed to wild salmon possible. Although an adult salmon may be relatively unaffected by an infestation of sea lice, the juvenile salmon’s small size and thin skin renders them highly vulnerable to a sea lice infestation – lethally vulnerable. Pink and chum juvenile salmon, furthermore, lack scales, making them even more vulnerable to the effects of sea lice than their scaled relatives Chinook and sockeye. The open lesions compromise a small fish’s ability to maintain its saltwater balance. Recently, even some B. C. residents are questioning their government’s unwillingness to address sea lice’s adverse affects on wild salmon stocks, as B. C. tourism is now being threatened by the decline in wild salmon. What does the future hold for sea lice? While the larger more complex organisms above the water squabble about regulations, human management – or mismanagement – of larger species does not appear to have a negative impact on the copepod population. A veterinary drug called Slice is used to treat sea lice infestations, and although fish farms are required to monitor sea lice and usually feed their fish Slice to cut down on lice infestations, the Canadian government has voiced suspicions that over time sea lice can develop resistance to Slice. Regardless of how the fish farm debate is decided, it looks like, as long as we continue to catch salmon, there will always be a few sea lice attached to them. Amy Carroll is a publications specialist with the Division of Commercial Fisheries at the Alaska Department of Fish and Game in Juneau.